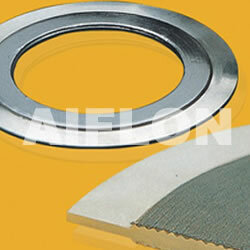 ﻿ Serrated gasket with outer ring - China Serrated gasket with outer ring Supplier,Factory - Cixi Aiflon Sealing Materials Co.,Ltd. The thickness of graphite or PTFE face is normally 0.5mm. Depending on centering ring with cheaper material (Normal: CS) and thinner thickness (Normal: 1.5mm) for Style 6400 SJ, maybe it is more economical than 6400JR.